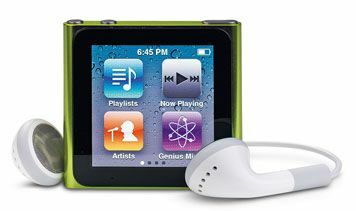 Apple iPod Nano 8GB review | What Hi-Fi? You need only take a glance back at the history of Apple’s iPod Nano, first released as a replacement for the iPod Mini, to see that this is a product that has struggled more than most to find its niche in the market. In its time, it has come in a variety of shapes and designs – from long and thin, to square, back to long and thin, and now small and square again. Relatively dramatic changes all. We weren’t completely convinced by this sixth-generation Nano when we first saw one. It no longer plays videos – but that screen is very small – and there’s no video camera. However a recent update has knocked £30 (about 20 per cent) off the price. It has also improved the fitness app and added a neat clock-face feature which allows you to view the Nano like a watch. The unit is still available as an 8GB or 16GB model. The iPod Touch is now considerably more expensive (although, of course, you also get far more in the way of features, too). So the Nano, with its excellent multi-touch screen, movable icons and predictably excellent sound, finally has space to breathe in Apple’s line-up as a fully functioning ultra-portable.